Last week the family went to DisneyWorld, while we had a blast we all came back with the plague. So between coughing fits and sleeping from taking too much NyQuil I have managed to draw a few new beasties. 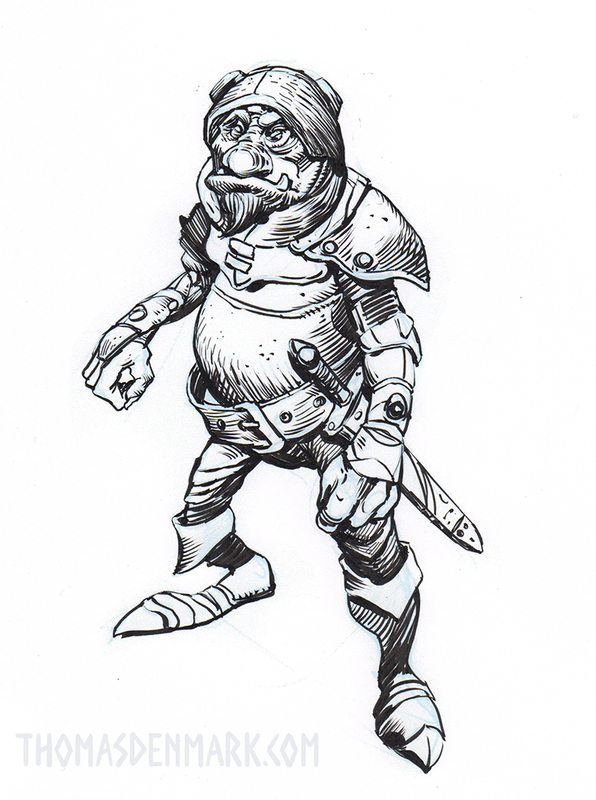 I've been fiddling with the description for this gnomblin and while I have lots of ideas, I've got nothing really coherent yet. In order to get a good post in this week I'm posting this one in very rough form with an outline that kind of shows the process of how I think about generating the stats and abilities for a new beastie. Gnomes are kind-hearted, family oriented illusionists, goblins are chaotic little murder machines who hate the light. Common theme: both dwell in the underground and are diminutive in size. Special: -1 to hit in sunlight. Illusion spells levels 1-3 (define spell list). A gnomblin has magical ability equivalent to double its hit dice. Gnomblins save vs. magic or wands with a +4 bonus. It is theoretically possible for individuals of even greater power to exist. The Game Master can roll spells randomly or determine appropriate choices from the Magic-User spell list. I've been developing this idea of goblins being fecund; willing to breed with anything and everything. Because of their unique DNA they are able to create offspring, mostly sterile, with almost any humanoid. 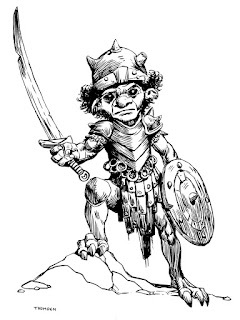 This opens up no end of options for interesting little goblin+ hybrids. I've been having a lot of fun drawing these little beasties, and hope you are enjoying them too, I have several more in the pipeline. Also the Gnome/Goblin war of 576 which I have a LOT more to say about in the future. 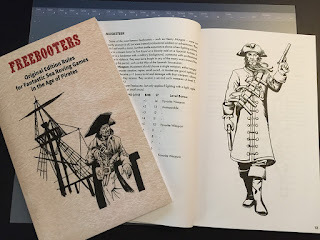 Freebooters Review on Save or Die! The Save or Die podcast reviewed our Age of Pirates old-school roleplaying game Freebooters! And they really gush about it, I'm almost embarrassed, but glad they love it so much. One of the things they note is how painstakingly researched the setting is and how historically accurate it is. This is not a fantasy game! Yes, it does include an optional character class that has magic, but it is respectful of the customs and beliefs of the region during the period and it is purely optional. Everything else about the game is rooted in realism and historical accuracy. 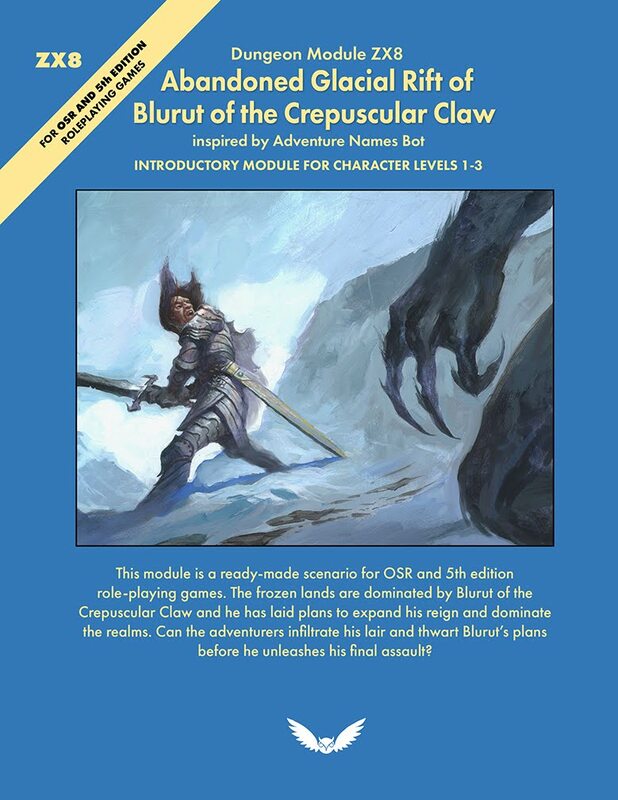 Interestingly one of the members on the podcast has his own YouTube channel, Ol' Man Grognard, where he has reviewed several Night Owl Workshop books. His reviews are worth watching for anyone who enjoys OSR games. Are you like me and never tire of getting, reading, and sometimes even playing Retro-Clones? Since more are published nearly every week, and there are already so many out there I was curious if anyone put together a comprehensive list. The problem, obviously, is in the definition of Retro-Clone. Are they all remakes of various versions of early D&D and its sources? 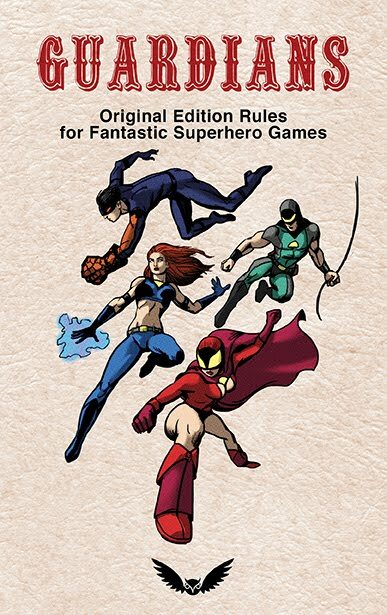 Or are they of any RPG from the early 80's and before? Or does the goal post keep moving so that it is any RPG more than 20 years old? (actually, I don't think that is a terrible definition, then it is much like some definitions used for classic cars). At this point the vast majority of them are of OD&D, Basic D&D, and 1st Edition D&D, with the occasional Chainmail and speculative "what would Gygax have done?" edition. Fortunately Taxidermic Owlbear has put together a pretty good page of them. And of course there is this old thread on the RPGSite which is an excellent compilation. 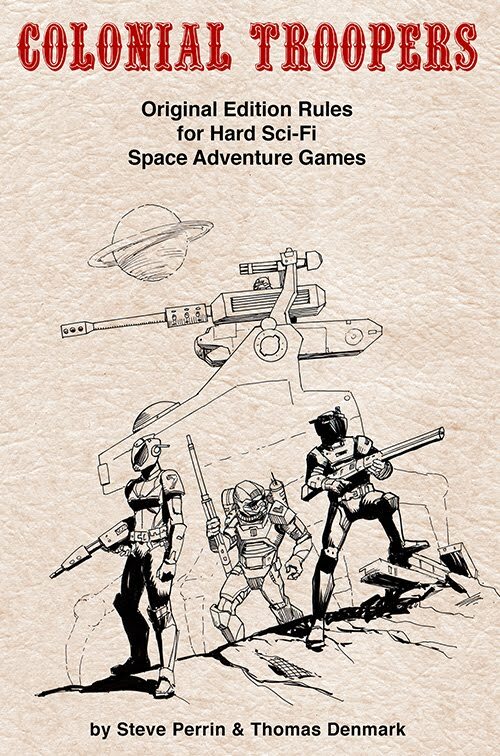 Poster of HawkMoor cutaway map is now available at DriveThruRPG. I've made a variety of cutaway maps over the years and have occasionally posted some of them here, but this one of the HawkMoor Underworld has been by far the most popular. I've seen it reblogged, pinned on Pinterest, tweeted, and spread around the net in unexpected places. It was one of those drawings where I spilled a bunch of ideas in my head down onto paper one day. You never know which drawings are going to resonate with people, and this one has. So I made it available as a high resolution download, or as a 12"x18" poster map you can put up in your gaming area. I received my proof copy today and it looks just like I designed it. The paper stock is glossy, the blacks are dark and rich, the touches of color came out as intended. And it comes in a bubble wrapped envelope with card stock to help protect it from damage during transit. 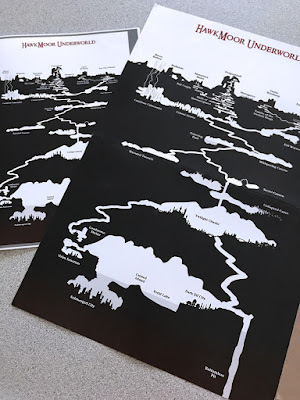 HawkMoor is a fantasy world I've been developing for sometime, really since the beginning of this blog, and piece by piece it has been coming together. If you've followed my Beasties of the Week posts you may have noticed little mentions here and there of this world. I have a lot more things set in this world to share on this blog over the coming weeks and months. Many dwarven cartographers perished to bring you this underworld cutaway map of the mysterious Lost Realm of Hawkmoor. Revealed for the first time are the Halls of Hammerguard deep under Dragonbluff. See how the Sewer Pits where the wererats lurk are connected to the Tombs of the Ancient Kings under Castle Werthorp. Far under Hawkmoor are pockets of civilizations such as the Twilight Citadel where underdwellers have built a great city. Deeper still is the city of the dark elves where few dare to venture into unless allied to those sinister and zenophobic beings. It is even rumored that a submerged city is home to one of the last remaining clans of shahada, the ancient race that spawned the sahuagin, the tritons, and the merpeople. This large wall map is sure to inspire many adventure ideas and stir your imagination! When a goblin couples with a halfling a sterile hybrid called a hoblin can be the result. 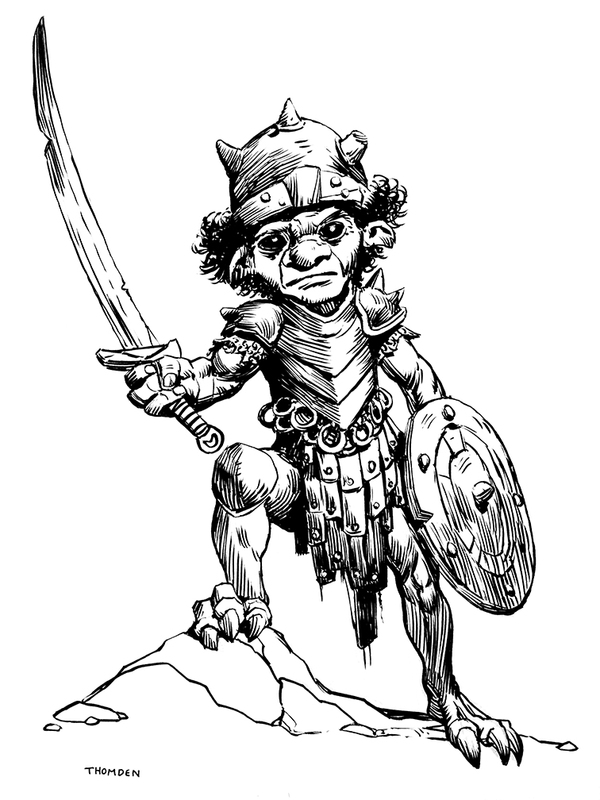 These creatures tend to take some of the more noble aspects from their halfling parentage, but do gain sensitivity to light and the ability to see in the dark. They also tend to be more feisty and courageous in battle than either of their heritages. Unfortunately due to their disturbing and unattractive appearance they are often spurned by the halfling community. Goblin clans will also rarely take them in. Thus they often spend their lives on the outskirts of civilization, trying to survive, and hoping someday to find a community that will let them in. 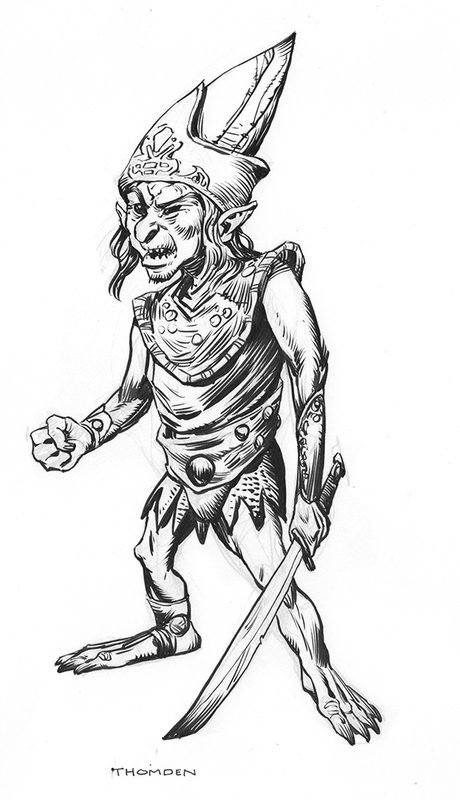 When a goblin breeds with a halfling a sterile hybrid called a hoblin can be the result. 1 in 10 of those will be born with a cruel demeanor. These vicious little monstrosities are cold, heartless, ruthless killers. They cannot adapt to society or a normal lifestyle and will live on the fringes. Stealing and murdering to survive. Unfortunately for the majority of hoblins this reputation seems to have spread to all of them, regardless of how kind hearted, generous, or honorable the hoblin is. Cruel hoblins are most often hermits, ambushing prey they believe to be susceptible. In some circumstances they will even eat halfling flesh. They are extremely stealthy, only able to be detected on a 1 in 6, or even 1 in 8 in nighttime in the wilderness. They collect any shiny little bits they can find and will have a nest lined with rags, matted hair, and scraps of things they've found or stolen. And while they may seem somewhat animal like they are actually deviously clever and will concoct vicious means to lure in prey.